In this article we review in detail the different types of hover lawnmowers, that are currently available on the UK market. There are a few options available that include both electric powered and also petrol driven. 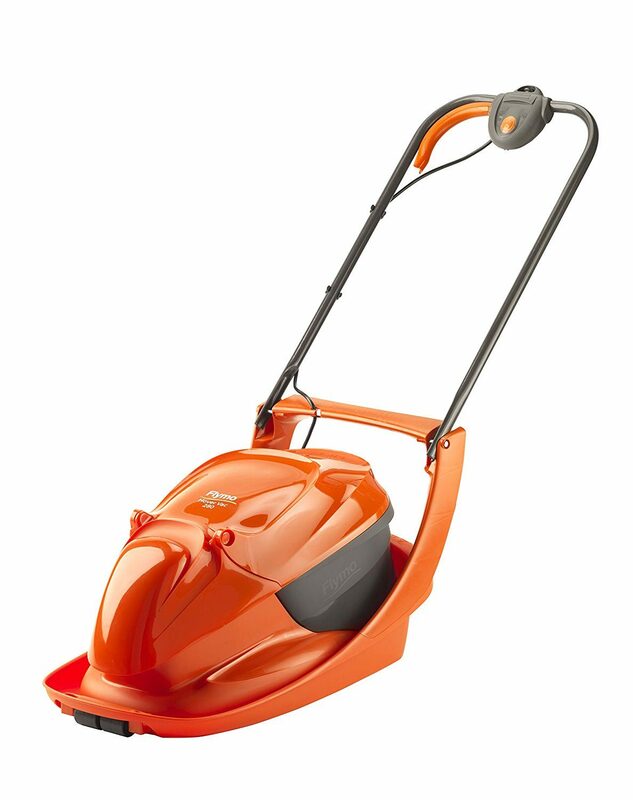 Below we have reviewed, the top 5 hover style lawn mowers. However before we look at those, it is worth taking a few moments, to consider who this type of mower is best suited for. Who Should Pick a Hover Lawnmower? These work by forcing a cushion of air, between the cutting blade, and the actual ground underneath. That is why they give a hovering effect. The air keeps the blades from digging down into, and damaging the grass. That makes them ideal for many people who have not got the energy to push and pull a mower on wheels. It also makes them very suitable for those with slopes on their garden. Petrol and electric corded​ lawnmowers still require a fair bit of effort to move around the garden. If your gardens are flat, this is not too difficult. If there is a slope though, then this can be tough enough on the arms and your back. 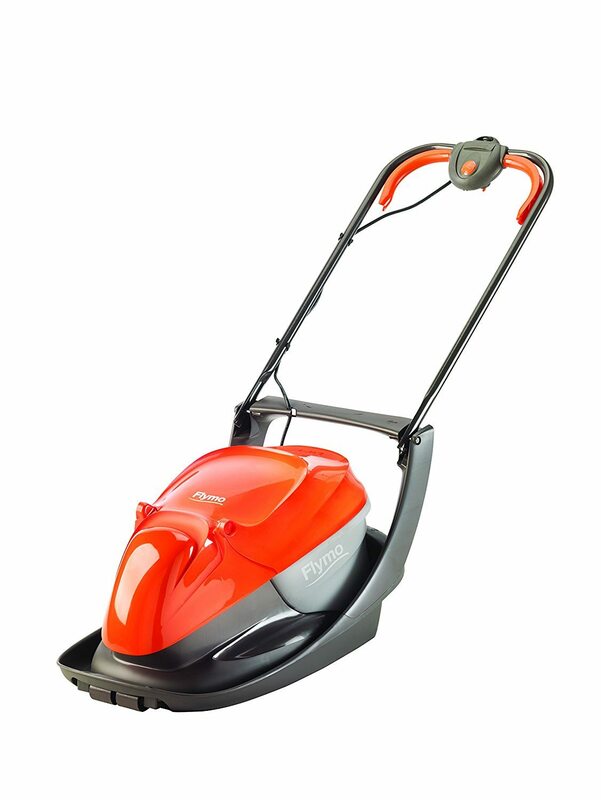 People with small gardens should also consider a hover style lawnmower. These are much easier managed and maintained, and still do an excellent job. The UK market is dominated by the Flymo brand. Along with another brand called Sovereign, these are the two leading brands that are currently available. You will also see the odd hover mower from the Qualcast brand. Below we have lined up the top 7 hover lawnmowers. We have placed these in order of best value along with the highest rated by buyers. Any ratings shown are an average, and marked out of a maximum of 100% buyer satisfaction. We have also used average retail UK prices. Both ratings and prices change constantly, so please always check before deciding to make any purchase. We have produced a table below of the top 5 mowers, and you can sort that table by clicking on the tabs at the top. If you click on the product name you will be taken to a short and concise review of each hover mower. Underneath the table, we have also included the best petrol driven hover mowers. As you can see Flymo pretty much dominate this list, and all of their mowers listed there, sell in their thousands. There are also plenty of spare parts available for these should you ever need them. Although the Qualcast is the number one, it is also the most expensive. As you can see they are all pretty much rated the same, with only the odd point separating the buyer ratings. 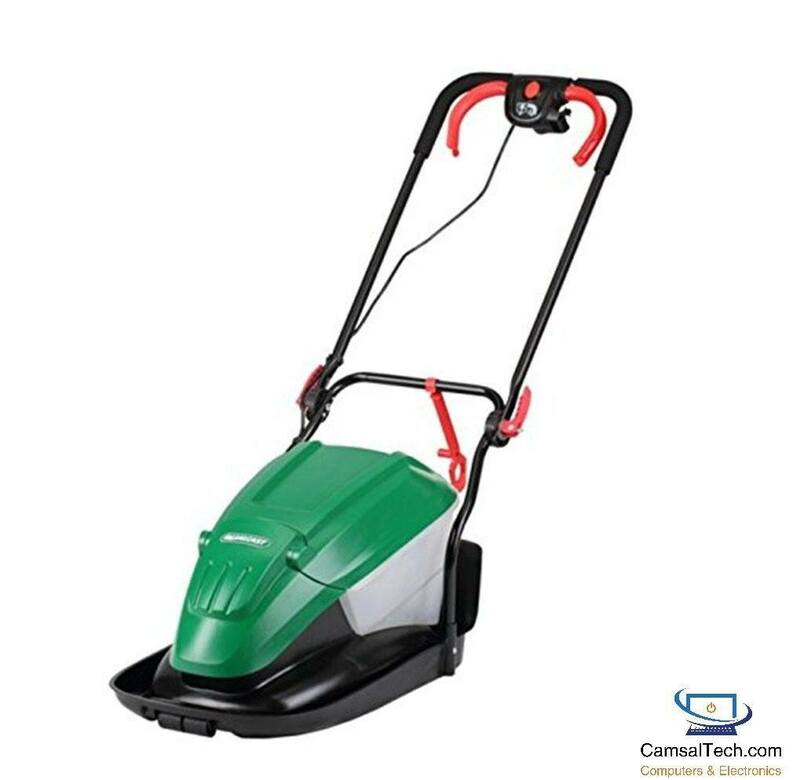 This hover mower comes in the classic Qualcast style with their classic green colour. Overall it is rated with a 92% buyer satisfaction, and is also the most expensive on the list. Qualcast are of course well known for making a good quality range of garden tools. It has a powerful 1,500 watt motor, a transparent 20 litre grass box and a double sided blade to do the cutting. The blade has a 33 cm cutting width, 4 cutting heights, adjustable handle and the power cable is 10 metres long. It can be difficult to find parts for this mower as not everyone stocks these. This is one of the highest rated Flymo hover mowers on the market. Overall it is rated with an 86% buyer satisfaction rating, and it has sold in its thousands.This particular model is not their best seller, but it is their second best seller. It has a powerful 1,300 watt motor, and a transparent 20 litre grass box. The blade has a 30 cm cutting width, 4 cutting heights (12-32 mm), and the power cable is 10 metres long. There is no assembly required, and it folds away very easily, for fast and easy storage. This hover mower is rated with an 88% buyer satisfaction. This is their highest selling model, but is also usually slightly more expensive than the one above. This has an RRP of £89.99, though you can usually find it a little cheaper online. It has an 1,150 watt motor, a 33 cm cutting width, (40 cm size also available but more expensive) 4 cutting heights (10-30 mm), and the power cable is 10 metres long. It is really lightweight and easy to store. Please not this mower does NOT collect the grass. For me that only makes this model suitable for very small gardens. 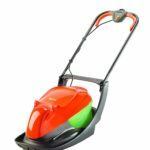 This hover mower is rated with an 86% buyer satisfaction rate and it is one of the cheapest on the list, and I think very good value for money. This one is suitable for small to medium sized gardens, and it does a nice job of collecting the grass. It has a powerful 1,300 watt motor, a 20 litre grass box and is light in weight at only 8.8 Kg. The blade has a 29 cm cutting width, 4 cutting heights, and the power cable is 10 metres long. This one is fairly new to the UK market and is selling really well. And last but not least on our top 5 list is the Easi Glide. It is rated as 4.2 out of 5 stars, and costs around £85. This one has rollers which makes a difference to others on the list. It has a powerful 1,400 watt motor, a 20 litre transparent grass box with a vision window and a 33 cm cutting width, with 4 cutting heights. The power cable is 10 metres long. It is easy to fold away the handles and also to store. 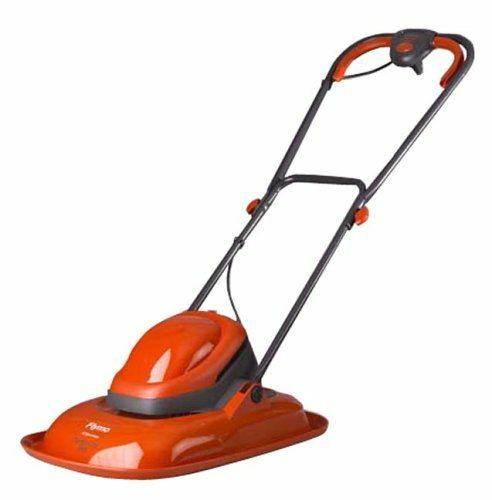 These hover mowers are really only suitable for small to medium sized gardens. 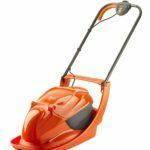 If you have a big garden or a lot of grass to cut, then it would be better to go for something like an electric rotary mower, or even a petrol driven mower. Which Hover Mower to Buy? Now let's have a look at which one you should buy. Personally I would recommend that you stick with a Flymo brand. They have been making these for years and they have continued to improve them. More importantly, they are almost maintenance free, and if you do need parts such as replacement blades, or cords, then these are easy to find, and relatively cheap as well. This is probably the single biggest complaint with all hover mowers. They do not do a great job of collecting all of the grass. I have used a lot of hover mowers, and all of them tend to spit some grass out of the side of the mower. Most models will collect most of the grass, some will compact it and that will make mowing a great deal easier. Some of the models however do not collect the grass. That means getting the rake out when you are finished and doing that. It will also mean getting the brush out for yards and paths. In a small garden that is not a lot of work, but in my opinion still a task that I do not want to do. I would recommend buying one with grass collection included. Although it will not collect all of the grass it will collect most of it. This is the width of grass that your mower can cut at any one time. These widths vary from as low as 29 cm and all the way up to 40 cm. The most popular width is either a 30 cm or a 33 cm. The wider the cutting width that faster you will be able to cut your grass. In all honesty there is very little time saved. Although a bigger cutting width may seem like a good idea, have a little think about where the mower may have to cut. If for example you have a narrow run of grass, or you need to get in between shrubs, then a smaller cutting width would be better. One of the joys of owning a hover mower is that the handle folds down very easily. That means you do not need a lot of room for storage. These mowers are also typically light at around 8 Kg (20 lbs) so most people can manage that, and even lifting it up is not too tough. This is a key consideration for many buyers and especially for those who are just not as strong and mobile as they used to be. When the grass is getting cut, it is certainly convenient to be able to look and see that the grass box is not full. More importantly though this box should be easy to remove and then attach again. On all of the Flymo, and even the Qualcast one, this is a basic enough feature and one that I believe is nice to have, though certainly not vital. For smaller gardens that is usually enough. If that is not long enough then you will need a good quality extension lead. 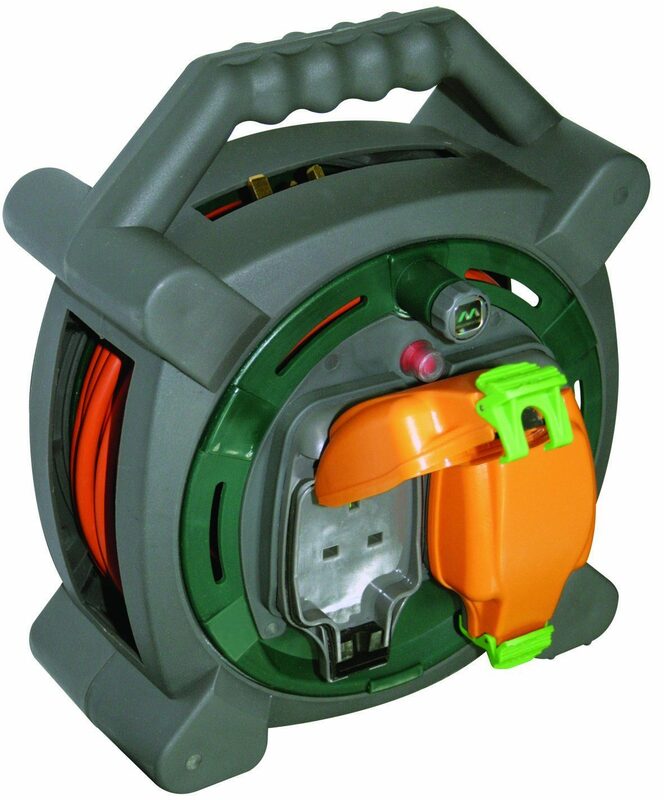 The Masterplug one shown below is very high quality, and will keep you safe when using any garden electric appliance. I now own a couple of these which I use for my gardening tools when doing the garden, one in my shed for the electrical appliances there, and also one in my garage for the same reason. We would also recommend that you use a Safety RCD Adapter. These have been designed to help protect people working with electrical appliances from getting a shock. When outside in the garden accidents do and will happen. Cutting a lead, water and rain or simple wear and tear of electrical appliances does happen. 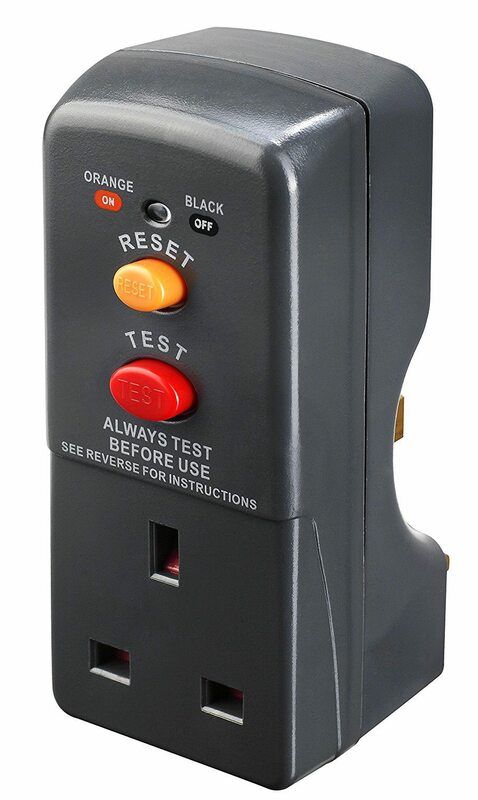 These small safety devices make sure that the electric is cut off instantly, should something inadvertently happen. In this section we answer the most frequently asked questions that people have about hover mowers. Q, Why does my mower not Hover? The key when starting up a hover mower is to tilt it slightly to the side. This tilting action allows the air to circulate under the main deck of your mower. Many people get a heavy feel if they don't do this action when starting the mower up. Other reasons for not cutting might be if the lawn or grass feels like a sponge under your feet. This sponge effect actually pulls a hover mower down and makes it ineffective. You can either wait for the grass to dry out, or scarify the grass which will improve it over time. Finally check the mower to make sure that there is no build up of grass under the hood or grass stuck in the fins. If you clean your mower after each use this will eliminate this problem. Q, Why does my mower not collect grass properly? Most hover mowers have some form of grass collection usually a small box and typically 20 litres in size. The mower then vacuums grass clippings from the lawn through a small aperture in the base of the grass box. Some very fine clippings are allowed back into the lawn as this acts as a natural feed for the lawn. Hovers use a cushion of air, and as a result there will always be a small amount of clippings that will be blown away from the mower. To minimise the amount of clippings try and walk in a straight line for optimum collection. Q, Why does my mower blow grass everywhere? I explained the reason for this just above, the nature of the hover is to blow air, and with that grass does seem to blow everywhere. A great tip to minimise this is to mow the lawn in a clockwise direction, as that blows all of the grass clippings to the centre of the lawn. Q, How do you adjust the height of the grass cut? It will vary depending on the actual brand of hover mower that you own. On some brands it is a simple central height adjustment lever found on the side. However with most Flymos, this can only be done by adding or removing spacers between the lawnmower's blade and cutting deck. Always carefully read the instructions for guidance before attempting to adjust the height of cut on your lawnmower.